Present state: Demolished - no trace of the station remains but Sherwood Vale bridge is extant. The platforms continued under the bridge. A second bridge in Sherwood Vale over the bottom end of the Mapperley Incline is also extant. Notes: Sherwood station was, like St. Ann's Well, located in a cutting between two tunnels. To the south was Sherwood Tunnel (442yd) and to the north of the station was Ashwell's Tunnel (70yd), the shortest of the four tunnels on the line. 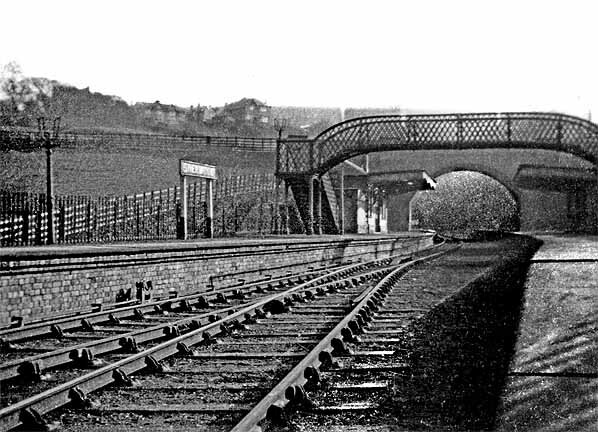 Sherwood was the only station on the suburban railway to be built on a curve. Access to the station was via an approach off Sherwood Vale into the station forecourt from where there was access to the goods yard. This included a cart weighbridge and office, lamp room, dock and cattle pen. The station had two facing platforms with ran under Sherwood Vale bridge at their south end. The main single-storey station building comprising a booking office and waiting room was located on the down platform with a brick waiting room on the up. As with other stations on the line, the buildings were designed by Thomas Chambers Hine. Both platforms were sheltered by wooden canopies with decorative valances supported by ornamental brackets. A wrought iron lattice girder bridge supported on cast iron columns connected the two platforms. A 30-lever signal box was located beyond the north end of the down platform; this controlled all movements around the station. There were sidings on both sides of the line to the north of the station. There were two parallel loops on the down side, from these there was a short siding running in front of the signal box into a cattle dock behind the north end of the platform. There was no goods shed at Sherwood as the yard was not as busy as the other two stations. On the up side there were two exchange sidings where LNER rails met 'end-on' here with those of the Nottingham Patent Brick Company with a steel rope-hauled incline up to the brickworks; this was powered by a stationary engine at the top. Ascending and descending trucks were controlled from a small brick built hut to the east of the bridge at the bottom of the incline. The two-storey stationmaster's house was between the forecourt and Sherwood Vale bridge behind the south end of the down platform. It was built from NPBC bricks with a slate roof. Its floor plan was a mirror image of the houses at St. Ann's Well and Thorneywood which were both built on the up side. This station was the first on the line to be affected by the arrival of the electric tramcar, which reached Sherwood as early as January 1901. It was closed with the other intermediate stations on 1 July 1916. The station was reopened for one day only on 10 July 1928, along with Thorneywood, when it was used to transport schoolchildren to and from Woodthorpe Park where they were to be inspected by King George V and Queen Mary as part of their visit to Nottingham. From 1931 onwards, the station was used for the thrice weekly freight service which operated between Daybrook and Thorneywood. The quantity of freight traffic was still considered acceptable; in 1935 the station received 1,197 loaded wagons and forwarded 195 loaded wagons. 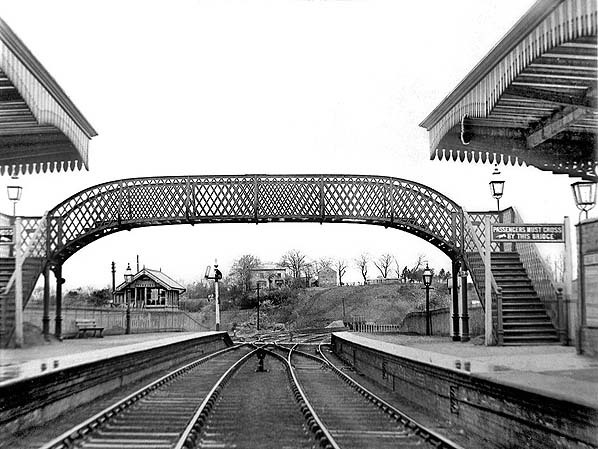 The up platform waiting room was demolished after the line was singled in 1930 and the footbridge was removed. After closure, further demolition gradually took place. In June 1953 the signal box was burnt down. 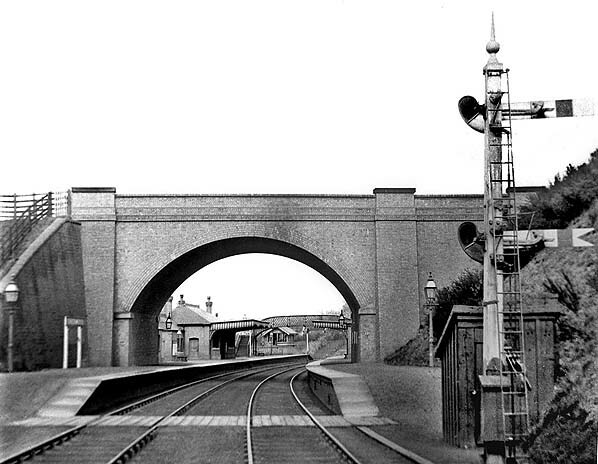 The platforms and the remaining station buildings were demolished in 1965 prior to building two tower blocks of flats (now sheltered housing), called Winchester Court and Woodthorpe Court; the rows of garages built for the flats followed the curve of the platforms. The last building to go was the stationmaster's house which was demolished c late 1960s. In 1985 Briarwood Court was built immediately south of Sherwood Vale bridge, which is extant. The property is surrounded by high metal railings which make access to the cutting to the south of the bridge difficult. The cutting has been partially filled but it is possible to walk the full length of it, although there is no trace of the buried north portal of Sherwood Tunnel. At the south end of the station site more garages have been built in the cutting leading to the south portal of Ashwell's Tunnel, of which there is no trace. The bridge at the bottom of the incline to Mapperley brickworks is extant but the arch is blocked with metal railings. 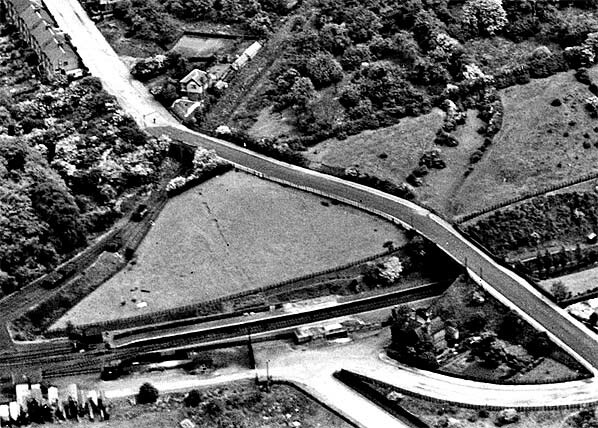 Click here to read Ard Dunby's recollections of Sherwod station. Ticket from Michael Stewart. Bradshaw from Nick Catford. Route map drawn by Alan Young. Looking north at Sherwood station in 1904. Sherwood Tunnel north portal is behind the photographer. The main station building comprises the booking office and waiting room, with a lamp room at the rear of the platform between the building and the bridge. Sherwood's 30-lever signal box is seen beyond the station on the down side. Regularly spaced gas lights are seen on the platforms. A timber fogman's hut is seen behind the signal on the right. 1900 1:2,500 OS map shows the layout of the station and goods yard. The station fronts onto a forecourt at the end of Mapperley Rise. 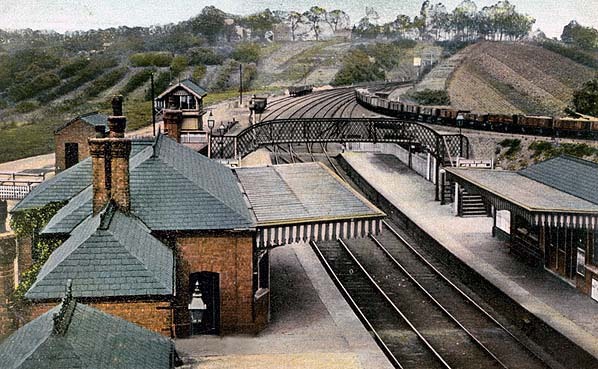 The main station building is seen on the down side with the stationmaster's house at the end of Mapperley Rise. The lamp room, which also acted as a Porters' room, is at the back of the down platform immediately north of Sherwood Bale Bridge. The two platforms continue in the cutting on the south side of the bridge; the north portal of Sherwood Tunnel is at the end of the cutting. The entrance to the goods yard is from the forecourt, with a weighbridge and office shown just inside the entrance at the back of the cattle dock which is seen behind the north end of the down platform. Sherwood's 30-lever signal box is seen just north of the dock. The yard comprises two parallel loop sidings from which a short siding runs into the dock. On the down side there are two exchange sidings, one running to the north end of the up platform. There is an end-on connection with the rope-worked incline to Mapperley brickworks. A second bridge over Sherwood Vale is seen at the bottom of the incline. Ascending and descending trucks were controlled from a small brick-built hut seen to the east of this bridge. Click here to see a larger version. Looking north from Sherwood station in 1904. Identical footbridges were provided at all three stations. The bridge is of wrought iron, standing on cast iron columns. Note the signs either side instructing passengers that they must use the bridge to cross the line. The cattle dock is behind the fence on the left. Note the somersault signal at the end of the platform. This type of signal originated on the GNR although they were later used on some Welsh lines by the GWR. There were still some in use in Lincolnshire into the 1980s. Click here to see a GN somersault signal at Bellwater Junction, between Boston and Skegness in the 'off' position in 1983. Sherwood station looking north from Sherwood Vale road bridge before May 1906. The south portal of Ashwell's Tunnel is just out of view round the corner. A large number of brick wagons are seen on the right; this siding leads to the bottom of the incline up to Mapperley Brickworks. The building in the bottom left corner is the lamp room which also acted as a porters' room. The weighbridge and weigh office are seen on the left just inside the gate to the goods yard. The goods yard was never as busy as the other stations on the line and the absence of any form of goods shed is apparent. Note the two gas lamps on the footbridge. The north portal of Ashwell's Tunnel at the north end of Sherwood station. Ashwell's is the fourth and, at 70yd in length, the shortest tunnel on the line. The original Act showed the line in a cutting rather than a tunnel. 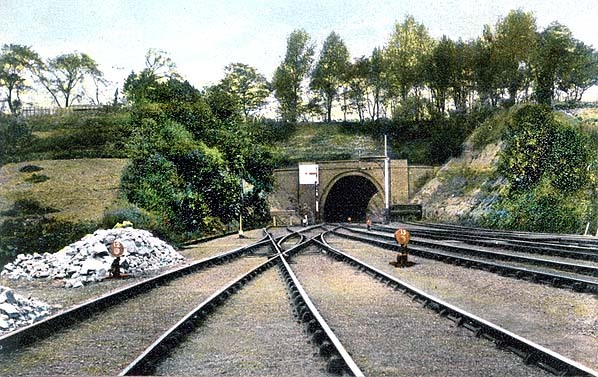 As the land above is entirely within the Woodthorpe Grange Estate a tunnel was provided in order not to sever the carriage driveway to Woodthorpe Grange which was built in 1874 as the family residence of Henry Ashwell. There are few photographs showing passenger trains on the Nottingham Suburban Railway. A passenger train for Nottingham is seen approaching Sherwood station in 1910. 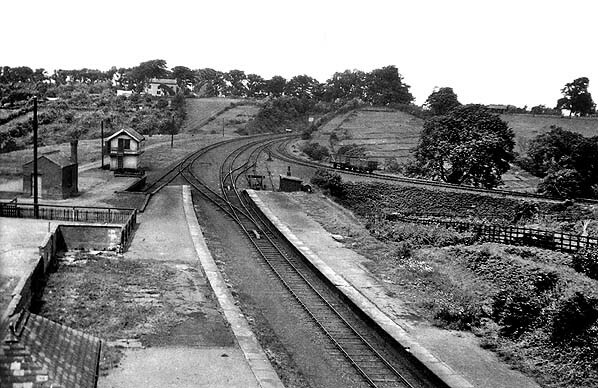 Sherwood station looking north probably shortly after the line was singled in 1930 and shortly before the platform buildings and footbridge were demolished. Sherwood station looking north from Sherwood Vale bridge c 1930s. 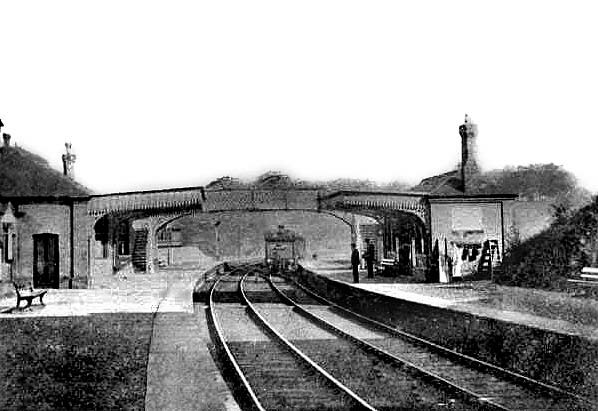 The line has been singled and the footbridge and all the platform buildings have been demolished with the exception of the lamp room, seen bottom left. The station was still open to goods traffic at this time but one of the loops has been lifted. The cattle dock is seen behind the north end of the down platform and the weigh office is seen to the left of the dock. On the up side the sidings remain unchanged with two brick wagons seen on the approach to the Mapperley Brickworks incline. The signal box had closed by this date.